In December 1997 Emu/Creative acquired Ensoniq Corp., an innovator in the design and development of electronic musical instruments. Ensoniq discontinued manufacturing the MR and ZR series synthesizers, and over the years it has become increasingly difficult to locate information and resources for the hardware. Some of the following items are locally archived on this site. Many of the items are links to external sites. Where the external sites or pages no longer exist, I tried to link to the Internet Archive or wayback machine. Snapshot of file downloads from the defunct Unofficial MR-Web site (zip) contains many patches in Unisyn and other formats. emagic sells Soundiver librarian that supports the Ensoniq MR family. MOTU sells Unisyn librarian that supports the Ensoniq MR family. Route66studios sells batteries and some other MR/ZR replacement parts. Sound Quest sells MidiQuest librarian that supports the Ensoniq MR family. 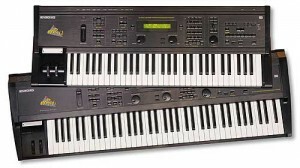 Starr Labs sells microtonal MIDI keyboards and controllers compatible with the Ensoniq MR family. Syntaur Productions sells some MR/ZR sounds, manuals and a few repair parts. THESONIQ repairs and sells Ensoniq parts. Vikant Corporation still sells 512K SRAM cards for MR-Rack. Someone is selling Ensoniq parts here. There appears to be a decent inventory, but the page owner or address are not identified on the web page.